Dabigatran (Pradaxa) is now available in New Zealand, fully funded, without Special Authority, as an alternative oral anticoagulant to warfarin, to prevent stroke in people with non-valvular atrial fibrillation (AF). Dabigatran is also registered for short-term use for the prevention of venous thromboembolism (VTE) after major orthopaedic surgery. It is available in 75 mg, 110 mg and 150 mg capsules. Which patients with non-valvular atrial fibrillation should use dabigatran? Dabigatran etexilate (Pradaxa®) 75 mg, 110 mg and 150 mg capsules were listed on the Pharmaceutical Schedule on 1 July 2011, fully funded and without restriction. If a patient taking warfarin has stable INR measurements and good venous access, then there is no clinical indication to switch to dabigatran. There is limited clinical experience with dabigatran in atrial fibrillation or with long-term use. Recommendations are based largely on a single, industry sponsored randomised controlled trial. Compliance with twice daily dosing is important as poor adherence may compromise the efficacy of dabigatran. Dabigatran is predominantly renally excreted, so patients must have creatinine clearance >30 mL/min. It should be used cautiously in patients with creatinine clearance between 30 – 50 mL/min. Older patients with normal serum creatinine may have low creatinine clearance. Potential adverse effects include bleeding, dyspepsia and gastrointestinal haemorrhage. The risk of myocardial infarction also appears to be increased. Potential interactions may occur with amiodarone, verapamil, aspirin, clopidogrel, NSAIDs, ketoconazole and St John’s wort. No specific monitoring test is available for anticoagulant effect and routine monitoring is not required. Creatinine clearance (or eGFR) should, however, be reassessed during long term use. No reversal agent is available. Dabigatran capsules are not able to be re-packaged into blister packs. As with every medicine it is appropriate to discuss with the patient the potential benefits and risks of dabigatran use prior to commencing treatment. For revised information on the use of dabigatran, see "Dabigatran revisited", BPJ 50 (February, 2013). Warfarin has a history of many years of clinical use but has two major limitations – a narrow therapeutic range of safe anticoagulation and a highly variable dose response. Variation may also occur for individual patients over time due to interactions with certain dietary components and the use of other medicines. Laboratory monitoring with INR and dose adjustment is required to achieve individually tailored, adequate, safe anticoagulation. In contrast, dabigatran has a predictable effect on anticoagulation and therefore routine monitoring is unnecessary. For this reason, dabigatran is likely to be more convenient than warfarin, however, it requires twice daily dosing. Dabigatran appears to be at least as effective as warfarin for preventing stroke in patients with AF, and has similar rates of bleeding (see below for a discussion of the evidence). What are the registered indications for dabigatran? Treatment should be continued life-long unless the risk benefit ratio for the patient changes. Dabigatran is also registered for short term use for the prevention of venous thromboembolism (VTE) after major orthopaedic surgery.2 It therefore provides an oral alternative to low molecular weight heparin, e.g. enoxaparin. What should dabigatran not be used for? Dabigatran should not be used for patients who require long-term prophylaxis for deep venous thrombosis or pulmonary embolism. Trials are underway to determine the effectiveness of dabigatran for long-term prophylaxis. It is not known whether dabigatran is clinically effective for VTE prophylaxis for long haul flights. What are the recommended doses of dabigatran? N.B. The length of the course varies with the type of surgery – knee replacement surgery ten days, hip replacement surgery 35 days. Creatinine clearance < 30 mL/min – there is no clinical experience of the use of dabigatran in this group of patients. Dabigatran is currently contraindicated in the New Zealand medicine data sheet, for this group of patients. Creatinine clearance 30 – 50 mL/min – use dabigatran with caution in this group of patients. For patients with non-valvular AF, with creatinine clearance 30 – 50 mL/min, there are no specific recommendations to reduce the dose of dabigatran from 150 mg, twice daily. However, patients with renal function in this range may be at increased bleeding risk due to reduced dabigatran excretion, especially if other risk factors are present. Some practitioners recommend using a lower dose of 110 mg dabigatran, twice daily. However, it is not known if this dose is safer and evidence shows that it is likely to be less effective than the 150 mg dose. The decision whether to prescribe dabigatran for patients in this group, and at what dose, should be individualised, with consideration given to factors such as the patient’s overall bleeding risk and their specific creatinine clearance level. Discussion with a cardiologist may be helpful. Recommendations are likely to become clearer as more clinical experience becomes available with this medicine. Dabigatran has a short half life of approximately 12–14 hours in adults with normal renal function.2 In people with impaired renal function, the half life is prolonged.2 Regular twice daily dosing with an interval of approximately twelve hours is required. Efficacy is likely to be compromised with poor adherence.6 Patients should be made aware that good compliance is important to sustain clinically effective anticoagulation. Although there is evidence that meals high in fat may delay the time taken to reach peak concentration in the plasma by approximately two hours, this does not appear to affect the bioavailability and clinical effectiveness of dabigatran.2,8 The capsules can therefore be taken with water, with or without food. Advising patients to take the capsules with breakfast and the evening meal may help with compliance. How do warfarin and dabigatran affect coagulation? All anticoagulant agents work by inhibiting the activity of thrombin. 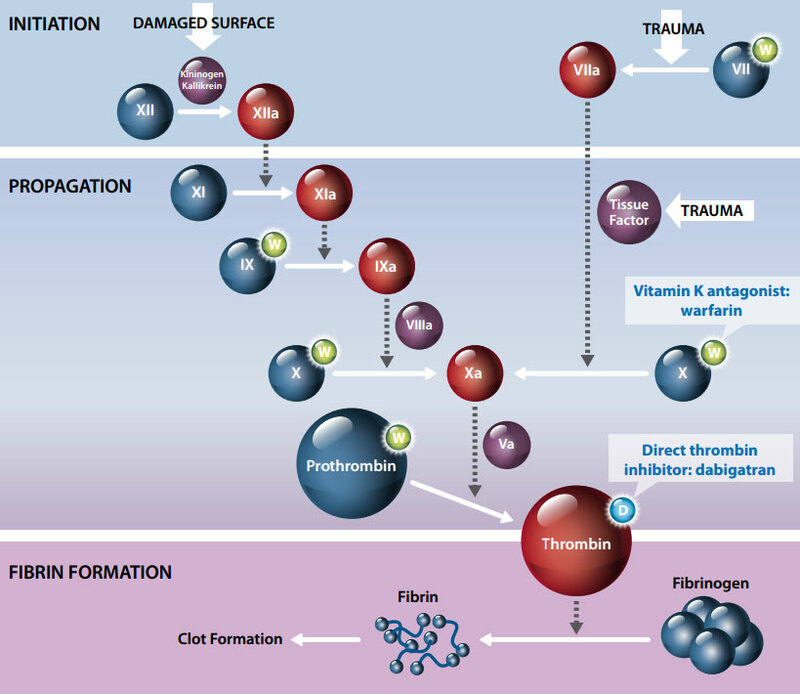 Thrombin enables the conversion of fibrinogen into fibrin during the coagulation cascade, therefore its inhibition prevents the development of thrombus. Dabigatran capsules must be used within 30 days once the bottle is opened. If exposed to moisture the capsules have the potential to break down and there is a risk of loss of potency.2,10 It is recommended that the capsules are stored in their original bottle, with the lid tightly closed, to protect from moisture. The lid of the bottle contains a desiccant to help prevent moisture affecting the capsules. The manufacturer has recommended to pharmacies that dabigatran should not be re-packaged into weekly blister packs. New packaging to overcome this issue is likely to be supplied in the future. What are the interactions with other medicines? The knowledge on medicine and dietary interactions involving dabigatran is still in its infancy and few clinically significant interactions have been reported.2,11 Table 1 lists the major medicine interactions that are currently known. Unexpected or even potentially life-threatening medicine interactions may be identified with more widespread and prolonged use.5 Vigilance is therefore required when initiating dabigatran or when any changes in the patient’s medicine profile are made. Dabigatran is contraindicated in patients taking oral ketoconazole, a P-gp inhibitor.2 Although no dose adjustment is recommended in the New Zealand datasheet, dabigatran should be used with caution in patients taking amiodarone or verapamil (also P-gp inhibitors).2,9 Some experts advise that patients take dabigatran two hours before taking verapamil and antacids.4,9 However, this may be impractical and using an alternative medicine may be a safer course of action until there has been more clinical experience with dabigatran. No clinically significant reduction in plasma concentration has been shown with concomitant use of antacids. Two hour separation of dabigatran and antacids is advised by some, or use an alternative medicine. Pantoprazole has been shown to reduce the plasma concentration of dabigatran by up to 30% and similar effects would be expected with other PPIs such as omeprazole. A subgroup analysis of the RE-LY trial indicated that the interaction is not clinically significant and that the combination of a PPI and dabigatran need not be avoided. Further studies are required. Amiodarone and verapamil have been shown to increase the plasma concentration of dabigatran and although no dose adjustment is generally recommended, this combination of medicines should be used with caution. No dose adjustment is recommended, however, a cautious approach is necessary. Clopidogrel has been shown to increase plasma concentration and in the RE-LY trial the use of antiplatelet agents doubled the risk of major bleeding (although this also applied to warfarin). Current expert opinion is that these medicines should not be used with dabigatran, although in secondary care their use may be considered on a case by case basis. This P-gp inducer is expected to reduce the plasma concentration of dabigatran. Avoid or use with caution. Antiplatelet agents and NSAIDs (both conventional and Cox-2) should be used with caution in people taking dabigatran because the risk of bleeding may be increased.2 Evidence shows that people taking dabigatran concomitantly with aspirin or clopidogrel have approximately double the risk of major bleeding, irrespective of the dose.1,2 (N.B. a similar risk applies to patients taking warfarin). Patients taking these medicines or NSAIDs should be monitored clinically for signs of bleeding, e.g. ask about bleeding noses, wounds that keep bleeding, gums that are bleeding more than usual. Some patients may require an intermittent check for anaemia. Amiodarone and verapamil are medicines that are used in a similar population of people to those that require anticoagulation. A cautious approach should be taken as there is evidence that if amiodarone and verapamil are taken within two hours of dabigatran, the plasma concentration of dabigatran increases.2,9 Clinical use over time may help determine whether this increase produces clinically significant adverse effects with combinations of these medicines. The constant = 1.23 for men, 1.04 for women. Is there any need for routine coagulation monitoring? Is the patient taking any other medicines that affect coagulation, e.g. aspirin? Is the patient taking any medicines known to interact with dabigatran? Does the patient have impaired renal function, or has renal function deteriorated? Management of bleeding complications in patients taking dabigatran should be individualised according to the site and severity. Dabigatran should be stopped and the source of bleeding investigated. Unless the bleeding is mild and able to be managed within the community, patients with bleeding should be referred urgently to secondary care (see Figure 2). If bleeding is a problem for a patient on dabigatran, what laboratory tests can be used to assess coagulation? The activated partial thromboplastin time (aPTT) and thrombin time (TT) can be used to guide management of patients with acute bleeding, but these tests are not suitable for fine tuning dabigatran dosage.13,14 These tests can indicate whether dabigatran is “on board”, i.e. whether there is anticoagulant activity, e.g. if compliance is an issue or to determine if the medicine has been excreted. The time of the last dose of dabigatran should be included on the blood request form as this is critical for interpreting results. Activated Partial Thromboplastin Time (aPTT) – this test does not have a linear relationship with drug levels. The test is moderately sensitive to the effect of dabigatran but the response is blunted at higher doses. Thrombin Time (TT) – at recommended doses, dabigatran increases TT. This test is very sensitive and although there is a linear dose-response relationship, the time is very prolonged at therapeutic doses and the effect is also method specific making results potentially difficult to interpret. The Ecarin clotting time (ECT) – this test is sensitive and has a linear dose-response relationship but is not widely available in New Zealand. Other tests to monitor coagulation status in patients taking dabigatran are being developed, however, they are not widely available and require standardisation for use. Dabigatran may also have an effect on a number of other coagulation tests and its use should be recorded on the request form if a patient taking dabigatran requires any coagulation test such as thrombophilia markers and lupus anticoagulant testing. All anticoagulant medicines inherently increase the risk of bleeding and patients should be informed of the risks and advised to let their General Practitioner know if they have any concerns. The most common adverse effect with dabigatran is bleeding and the risk of major bleeding is comparable to that of warfarin.1 In the RE-LY trial, dabigatran (150 mg or 110 mg), caused fewer intracranial haemorrhages and life-threatening bleeds when compared to warfarin, however, rates of major gastrointestinal bleeding were higher for patients on dabigatran than those on warfarin.1 Overall the bleeding risk for patients taking dabigatran is greater at the higher dose of 150 mg, twice daily, and decreases when lower doses are used. For more information regarding the risk of intracranial haemorrhage in dabigatran, see "Correspondence: An international perspective on the use of dabigatran", BPJ 52 (April, 2013). Major or severe bleeding, regardless of location, may lead to disabling, life-threatening or even fatal outcomes. Dabigatran should not be used in patients with clinically significant bleeding or who are at high risk for bleeding. There is no antidote for bleeding from dabigatran, unlike vitamin K for warfarin. If haemorrhagic complications occur treatment should be stopped. For advice about tools to estimate stroke and bleeding risk, see: “The warfarin dilemma”, BPJ 31 (Oct, 2010). What adjustments in dabigatran dose are required for operative procedures? At present there is limited evidence and clinical experience with the use of dabigatran prior to surgery. It is anticipated that the risk of bleeding with dabigatran is likely to be similar to the risk for a patient taking warfarin. However, it should be considered that prolonged bleeding times with dabigatran cannot be reversed, unlike warfarin (with vitamin K able to be used). Planning has always been required for patients taking warfarin and the situation will be no different for patients taking dabigatran. Good communication should be maintained between primary and secondary care so clear consistent instructions for patients can be given and followed. The bleeding risk, the type of surgery planned and the renal function of the patient should be considered. Warfarin does not need to be stopped for some procedures such as dental extractions and minor surgery if the patient’s INR value is at the lower end of the therapeutic range and their individual risk of bleeding is low. There is limited information about the use of dabigatran in this situation, but it can be assumed that a similar assessment of risk can take place, although bearing in mind that a bleeding event with dabigatran cannot be reversed. The Haematological Society, in association with Medsafe, PHARMAC and the Centre for Adverse Reactions Monitoring (CARM) is collecting data about adverse bleeding events experienced by patients using dabigatran. Dr Paul Harper, consultant haematologist at Palmerston North Hospital is co-ordinating this review. He asks that all patient bleeds, adverse events or discontinuation of therapy with dabigatran (Pradaxa) be reported to CARM. Events should be reported regardless of whether the patient required hospitalisation. If in doubt, report – it is not necessary to be certain that an adverse reaction is caused by a medicine in order to make reporting worthwhile. How can bleeding be managed for people taking dabigatran? Unlike warfarin and heparin, no specific antidote is available to reverse the anticoagulant effects of dabigatran. Administration of vitamin K or an infusion of plasma will not reverse the anticoagulant effect. Details of the management of moderate, severe or life-threatening bleeding is available from: www.pharmac.govt.nz/2011/06/13/Dabigatran bleeding management.pdf. Are on warfarin with a stable (or easy to control) INR and who are comfortable with the need for INR monitoring. Patients on warfarin who have INR values that are consistently within the therapeutic range are less likely to benefit from a switch to dabigatran. When treating patients with atrial fibrillation it must first be decided whether anticoagulation is indicated. This can be determined using a risk assessment tool such as CHADS2 or CHA2DS2VASc. The next step is to choose the most suitable anticoagulant for that individual patient. See “The warfarin dilemma” BPJ 31 (Oct, 2010) for further discussion on risk assessment tools. Interactions largely unknown, clinical experience over time likely to reveal more. Major GI bleeding rates may be higher than with warfarin, however, rates of intracranial haemorrhage and life-threatening bleeding may be lower with dabigatran. How do you change from warfarin to dabigatran? How do you change a patient from dabigatran to warfarin? Best Practice tip: If switching a patient from warfarin to dabigatran, notify the local laboratory by phone or email so that they can update their records and avoid unnecessary INR testing. Patients taking warfarin are often registered with a laboratory for regular, long-term repeat INR’s. The evidence for dabigatran – can we RE-LY on this? The Randomised Evaluation of Long-Term Anticoagulation Therapy (RE-LY) trial was a “non-inferiority” trial.1 In this type of trial, a new medicine is compared with a current standard treatment in an attempt to determine whether the new medicine is no worse than the usual medicine.18 The new medicine does not have to be superior to the older medicine. In contrast, randomised trials usually assess if a new medicine is better than a current medicine or placebo and are called superiority trials. The RE-LY trial therefore had to show that outcomes for the people who took dabigatran were at least as good as the outcomes for the people who took warfarin. This large, randomised, non-inferiority clinical trial compared two doses of dabigatran (110 mg and 150 mg administered twice daily) to warfarin treatment (aiming for INR values of 2–3) in over 18,000 patients with atrial fibrillation.1 The study was of hybrid design with medicine administration blinded for patients on dabigatran but not for warfarin. What were the strengths of the RE-LY trial? The trial was large, including over 18,000 patients from multiple countries. Follow up of participants was excellent with 99.9% of patients completing follow up assessments over a median time frame of two years.1 Patients were allocated randomly into the three treatment groups (dabigatran 110 mg twice daily, dabigatran 150 mg twice daily or warfarin). Administration of dabigatran was blinded, however, warfarin was not because of the need for INR monitoring. The investigators were aware of this potential for bias and therefore implemented strategies to minimise bias such as arranging for assessment of the outcomes to be carried out by two independent parties who had no knowledge of the treatments received. What were the limitations of the RE-LY trial? At this stage the longer term effects (post two years) of dabigatran are not known although there is an ongoing multi-centre follow up study in place (RELY-ABLE). Dabigatran may well provide a solution to some of the problems associated with the use of warfarin such as its unpredictable and significant inter-individual variability in response and narrow therapeutic window which necessitates frequent INR monitoring as well as numerous food and medicine interactions.5 However, the importance of the frequent patient contact that accompanies INR monitoring should not be forgotten as this often goes beyond “a simple blood test”. The main clinical trial (RE-LY), which has prompted the review of recommendations in atrial fibrillation guidelines, included just over 18,000 people who took dabigatran for two years.1 There is still a lot to learn about dabigatran – its effectiveness, adverse effects, longer term safety and interactions with other medicines. This information will only be gathered once it has been used extensively over the next few years. Like all medicines the promise that dabigatran brings must be balanced against its potential risks and uncertainty, therefore a cautious approach to its use is recommended. Did you know there is an audit related to this topic? See "Renal function testing in people taking dabigatran", bpacnz (2012). Connolly SJ, Ezekowitz MD, Yusuf S, et al. Dabigatran versus warfarin in patients with atrial fibrillation. N Engl J Med 2009; 361(12):1139–51. Boehringer Ingelheim (NZ) Ltd. Dabigatran etexilate (Pradaxa). Medicine data sheet. Available from: www.medsafe.govt.nz (Accessed Jul, 2011). Ezekowitz MD, Connolly S, Parekh A, et al. Rationale and design of RE-LY: Randomized evaluation of long-term anticoagulant therapy, warfarin, compared with dabigatran. Am Heart J 2009;157:805-10. Boehringer Ingelheim Canada Ltd. Pradaxa. Product Monograph. Oct, 2010. Available from: www.boehringer-ingelheim.ca (Accessed Jul, 2011). Ma TK, Yan BP, Lam YY. Dabigatran etexilate versus warfarin as the oral anticoagulant of choice? A review of clinical data. Pharmacol Ther. 2011 Feb; 129(2):185–94. Hankey GJ, Eikelboom JW. Dabigatran etexilate: A new oral thrombin inhibitor. Circulation 2011;123:1436-50. Ogawa S, Koretsune Y, Yasaka M, et al. Antithrombic therapy in atrial fibrillation – Evaluation and positioning of new oral anticoagulant agents. Circ J 2010;75:1539-47. Douketis JD. Dabigatran as anticoagulant therapy for atrial fibrillation. Pol Arch Med Wewn. 2011;121(3):73-80. Nutescu E, Chuatrisorn I, Hellenbart E. Drug and dietary interactions of warfarin and novel oral anticoagulants: an update. J Thromb Thrombolysis (2011) 31:326–43. U.S. Food and Drug Administration (FDA). Drug safety Communication: Special storage and handling requirements must be followed for Pradaxa (dabigatran etexilate mesylate) capsules. FDA. Mar 2011. Available from: www.fda.gov (Accessed Jul, 2011). British National Formulary (BNF). BNF 60. London:BMJ Publishing Group and Royal Pharmaceutical Society of Great Britain, 2010. Baxter K (Ed). Stockley’s Interaction Alerts. [online] London: Pharmaceutical Press. Available from: www.medicinescomplete.com/mc/stockley/current/ (Accessed Jul, 2011). Samama MM, Guinet C. Laboratory assessment of new anticoagulants. Clin Chem Lab Med 2011;49(5):761-72.
van Ryn J, Stangier J, Haertter S, et al. Dabigatran etexilate – a novel, reversible, oral direct thrombin inhibitor: Interpretation of coagulation assays and reversal of anticoagulant activity. Thromb Haemost 2010;103:1116-27. Lip GY, Lane DA. Does warfarin for stroke thromboprophylaxis protect against MI in atrial fibrillation patients? Am J Med 2010;123:785-9. Bendel SD, Bona R, Baker WL. Dabigatran: an oral direct thrombin inhibitor for use in atrial fibrillation. Adv Ther 2011; [Epub ahead of print]. Wann LS, Curtis AB, Ellenbogen KA, et al. ACCF/AHA/HRS focused update on the management of patients with atrial fibrillation (update on dabigatran): a report of the American College of Cardiology Foundation/American Heart Association Task Force on Practice Guidelines. Circulation. 2011;123:1144 –50. Scott IA. Non-inferiority trials: determining whether alternative treatments are good enough. MJA 2009;190(6):326-30. Kirley K, Rowland K. PURLs: Time to try this warfarin alternative? J Fam Pract. 2011 Apr;60(4):220-2. Raju N, Hankey G. Dabigatran etexilate in people with atrial fibrillation. BMJ 2010;341:c3784. University of British Columbia. Therapeutics Initiative. Dabigatran for atrial fibrillation. Why we can not rely on RE-LY. Therapeutics letter Jan-Mar 2011. Available from: www.ti.ubc.ca (Accessed Jul, 2011). Unger EF. Application number 22-512. Summary Review. FDA – Center for drug evaluation and research. Dec 2010. Available from: www.fda.gov (Accessed Jul, 2011). Edwards D. Dabigatran v warfarin. Compare with a higher standard. BMJ 2010;341:c5984. Wallantin L, Yusuf, Ezekowitz M, et al. Efficacy and safety of dabigatran compared with warfarin at different levels of international normalised ration control for stroke prevention in atrial fibrillation: an analysis of the RE-LY trial. Lancet 2010;376:975-83. Jarrod Newell said: 31/08/2016 5:12:02 p.m. This article might be due an update. Antidote now available and can be used in DVT prophylaxis as I understand? The Editor said: 2/09/2016 4:25:33 p.m. Thank you for the comment. An update on antithrombotic medicines was published last year (2015) and is available here: www.bpac.org.nz/BPJ/2015/April/antithrombotic.aspx It is correct that a reversal agent for dabigatran is approved for use in New Zealand. Idarucizumab is indicated for the reversal of dabigatran anticoagulation before emergency procedures or for uncontrolled bleeding. This is an injectable preparation that is not currently subsidised.